Across the street from Richard Meier’s nearly-complete new black glassy-facaded condo/rental tower at 685 First Avenue (known as 685 First), between First Avenue and the East River, a boarded-up construction site has remained quiet for the better part of a decade. Now, Curbed reports, the site’s developer, Solow Building Company, headed by Sheldon H. Solow, 89, and son Stefan Soloviev, confirms the site’s awakening and imminent transformation into three condominium buildings and a fourth building, to be a biotech office, using the 2012 master plan penned by Meier’s architecture firm. 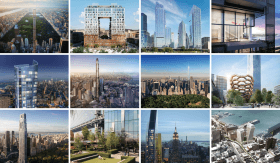 Along the East River just south of the United Nations, Pritzker Prize-winner Richard Meier’s 42-story, 460-foot-tall tower has officially topped out, CityRealty learned. 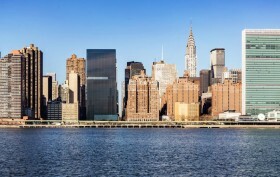 Developed by Sheldon Solow’s East River Realty Development, the skyscraper at 685 First Avenue has an all-black, glassy facade to offer residents privacy and create a uniform appearance on the outside. Upon completion in 2018, the Turtle Bay residential tower will feature 556 rental and condominium apartments, with incredible panoramic waterfront views. 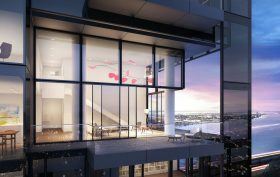 Richard Meier’s 685 First Avenue–the starchitect’s largest and tallest building in the city to date–has begun its above-ground ascent, reports CityRealty. The 42-story, 460-foot-tall slab tower is located along the East River at 40th Street, just south of the United Nations, and has gained attention for its dark glass facade, a noticeable shift from Meier’s signature beige aesthetic. Its 408 rentals and 148 condominiums are expected to be completed by early 2019, and now that construction is “craned and above street level,” the project is well on its way. The largest and tallest building in NYC from Pritzker Prize-winning architect Richard Meier is rising at 685 First Avenue, just south of the United Nations at 39th Street and First Avenue along the East River. Though developer Sheldon Solow bought the 30,000-square-foot site as part of his Turtle Bay South master plan 16 years ago, construction only kicked off in March. 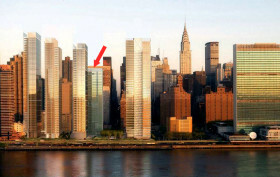 A couple months later, renderings were revealed of the 42-story slab tower’s dark glass facade–a departure from Meier’s typical beige designs and his first ever black building–and now the Times has shared the first interior renderings, along with new details about the residential breakdown (there will be 408 rentals and 148 condominiums) architectural specifics, and amenities. Pritzker Prize-winning architect Richard Meier has long been known for his modestly-scaled building designs with exteriors on the whiter side of pale. 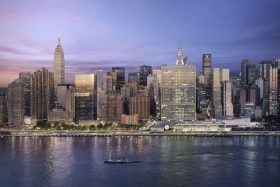 But for developer Sheldon Solow‘s new 42-story 556-unit residential building, currently under construction at East 39th Street and First Avenue on Manhattan’s East Side, the New York Five starchitect will be designing a tower of black glass. Construction has finally begun on the westernmost lot of Sheldon Solow’s Turtle Bay South master plan, 16 years after the developer purchased the site. Excavators are picking away at the 30,000-square-foot site at 685 First Avenue that has long held a surface parking lot and is just a small portion of a larger, long-planned development straddling First Avenue between East 35th and 41st Streets. 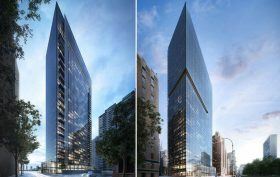 Last August, plans were filed for 685 First, which will be a girthy 42-story residential tower with 555 rental units and 800,000 square feet of gross floor area. 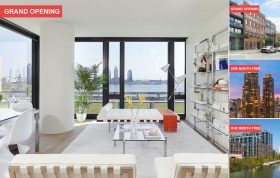 The tower is being designed by Pritzker Prize-winning architect Richard Meier, a surprising choice given the American architect is best known for his modest-scaled projects and white exteriors, while Solow is best known for their monolithic towers sheathed in black glass curtain walls. 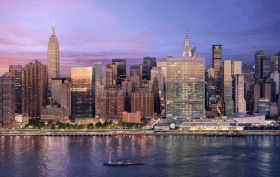 Nevertheless, when complete, the tower will be Meier’s largest ever project in New York and will be just one of four residential towers and a pavilion he is scheduled to design for the billionaire developer.